Arguably the most important ecosystem in your business, the Cash Conversion Cycle is a gauge on the performance-driving elements of your business…..and surprisingly, most CEO’s do not know what the measure of their Cash Flow Conversion Cycle is, in number of days or how to reduce that number effectively. The FreshBI ‘Cash to Cash Dash’, powered by Power BI, measures your Cash Conversion Cycle and it also reveals how each team contributes to the speed of this cycle. Arguably the most important ecosystem in your business, the Cash Conversion Cycle is a gauge on the performance-driving elements of your business…..and surprisingly, most CEO’s do not know what the measure of their Cash Flow Conversion Cycle is, in number of days or how to reduce that number effectively. 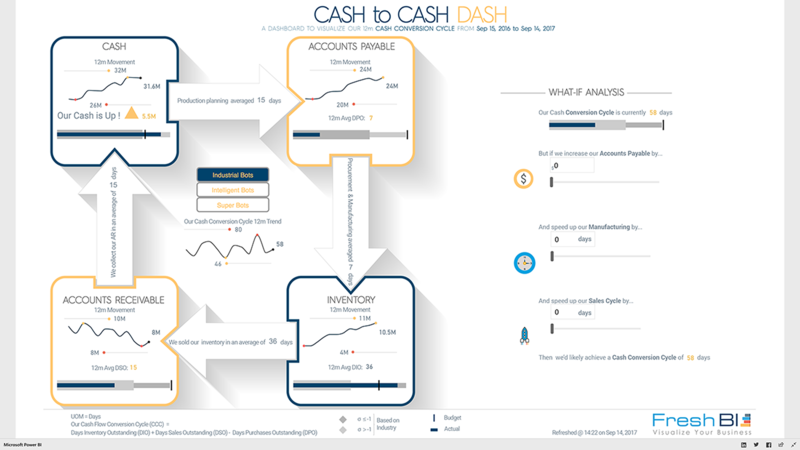 The FreshBI ‘Cash to Cash Dash’, powered by Power BI, measures your Cash Conversion Cycle and it also reveals how each team contributes to the speed of this cycle. Your story begins with your kinetic cash, waiting to be transformed into value and consequently, more cash. Using the ‘Cash to Cash Dash’ you can observe significant revelations about the time taken invoke Accounts Payable and commence production and the purchase of inventory. The status of Accounts Payable and your Days Payable Outstanding, which is 1 of 3 components in measuring your Cash Conversion Cycle, are also surfaced. 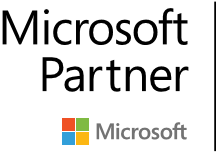 Supplier performance in delivering inventory and your own manufacturing performance in completing the manufacture of finished goods are tracked next. As part of this stage in the cycle, key inventory metrics including Days Inventory Outstanding surface at this point, the 2nd key component of your Cash Conversion Cycle. The 3rd major stretch is when your customers show their excitement about your product line by purchasing your inventory on credit. The effectiveness of your sales team in turning inventory into sales is a key measurement at this stage, together with key metrics about your Accounts Receivable, including the final component in measuring your Cash Conversion Cycle, Days Sales Outstanding. Until finally you collect your cash, experience the value added by your Cash Conversion Cycle and it is all down hill from there. You find that the analysis of cash collection comes alive at this point in the process, giving you the opportunity to refine your cash collection process, reduce your cash conversion cycle and continuously profile your customers. Let the FreshBI ‘Cash to Cash Dash’ simplify your ‘Intel’ experience and help you to take important steps toward refining your operational activities and reduce your Cash Conversion Cycle.